I took my first business trip as a stay-at-home dad last week. Okay, it wasn't really a "business trip," but I think it's fun to call it that since my main purpose during the journey was to watch the kids, which is my job. 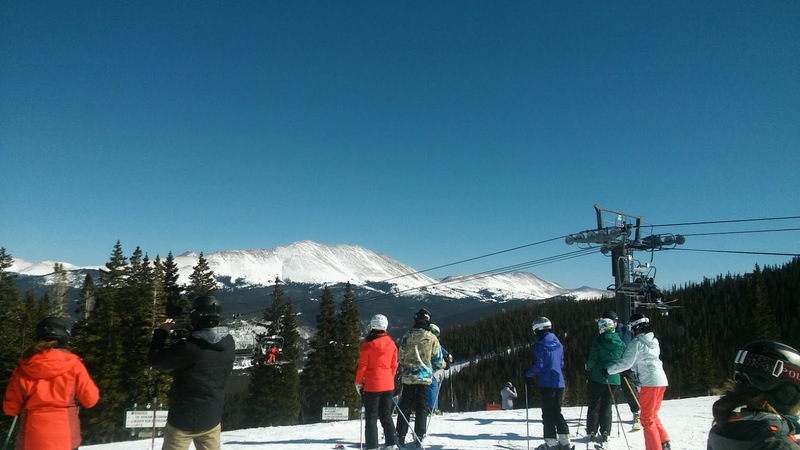 My in-laws had decided to plan a ski trip to Breckenridge, Colorado during the busiest ski weekend of the whole season, President's Day. I have standby flights through my job, which we elected to use instead of forking over $1000 for all four of us to fly, so I knew immediately this was going to be a tough one. The flight was fine, though my little screen was broken so I couldn't watch a movie. (I love watching airport movies, mostly because they edit out most of the bad stuff, so I feel like I can watch what would be otherwise vulgar movies with ease...call me old fashioned.) We got there and the air was clear and the mountains beautiful. 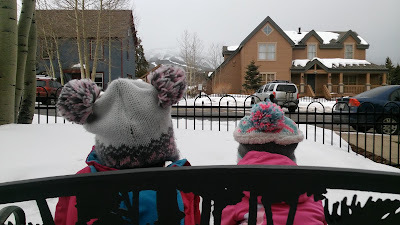 While waiting for the luggage, we tried to arrange for our car trip to Breckenridge, which was proving to be more difficult than we realized. I guess people typically don't fly into the Vail airport and then go to a different resort. Also, while we were sorting out options, we noticed our bags never arrived. Katie spoke with the baggage man and he informed us they were still in Denver. Great... He did us a favor and put them on another airline that was headed to Vail, though it wasn't set to arrive for seven hours! If you've ever been to the tiny Vail airport, you know it is not a place you can entertain kids in for seven hours! We weighed more options, did some research and decided to take the bus into town for a bowling alley/pizza place someone recommended. We got to the house, wiped out and ready to sleep. Our whole family was there and partying, except for my mother-in-law, who had gotten altitude sickness! My father-in-law also chipped his tooth! Another bad omen... I went straight to bed with the kids and tried to rest, though Ellie was still not feeling well and so not sleeping well. The floor we were on was also incredibly cold, but thankfully they had tapestry-thick blankets and we were next to the hot water heater room, which provided some warmth. The next day was my day to snowboard, so I got up and headed to the slopes with cousin Steph. Though my bag never arrived, our ski stuff was in the board bag, and thankfully Steph's boyfriend wears the same size snowboard boots as me. As we crested the lift exit, I reminded her that I hadn't ridden in two years (to my shame), so as to cover myself for any slip ups or falls that might occur. 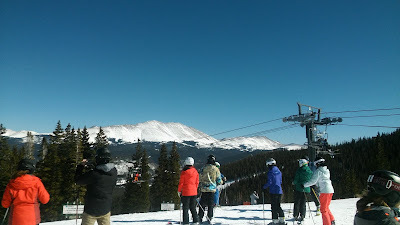 As soon as we headed off the lift, she skied over to a double black diamond and said, "How about this one for a warm up?" (She is really good.) I said sure, not wanting to appear like a novice, and surprising handled the slope really well. (I learned later she was half-kidding about the double black, so I impressed her with my willingness.) We rode a few runs and then met up with family, which took ages getting so many people together, and then waiting in one of the longest lift lines of my life (time weighs more heavily when you just paid $150 for a lift ticket). Eventually we made it to the top, only to depart from the family (their skill level wasn't quite the same apparently), and happenstancially meet up with some other family members -- so it all worked out. The rest of the ski day was fun, though at lunch I got a text from Katie that a house doctor had showed up to look at her mom and checked out Ellie while she was there: she had the flu. Great... After lunch I split from the group to try and make it to the top of the mountain (closed by the time I got there), and then a terrain park (also closed) -- marking this the only snowboard trip I can remember where I never hit a single jump! I went home that night to find Ellie and my mother-in-law with oxygen machines on and tubes in their noses. Unfortunately, I was too exhausted to be much help, though I rallied some strength to help get them to bed, and then passed out myself. Unfortunately, due to Ellie's flu, she did not sleep well, which meant neither Katie nor I slept well either (we were all sharing a room); though the heater was fixed and now the room was blazing hot! The whole week went this way, making rest an elusive thing on an already stressful trip. The next two days were Katie's to ski (I owed her one from being pregnant during a Lake Tahoe ski trip, and then nursing Waverly while I rode in California), so I stayed home, making this my "work trip." Entertaining two toddlers all day in someone else's house turned out to be not as terrible as I expected, though I did allow far more TV time than normal due to sickness. That night we were all supposed to go out to a nice dinner, but upon arrival Ellie looked just awful and Waverly promptly knocked two water cups off the table, so I took the girls home and let the grown-ups have a quiet evening. The view from our place on a snow day. Day three was the sleeping day, where Waverly took a nap right after breakfast, and then Ellie right after lunch. My mother-in-law slept much of the day away as well, still recovering from the altitude, and so I piddled around the house with one or no daughters. 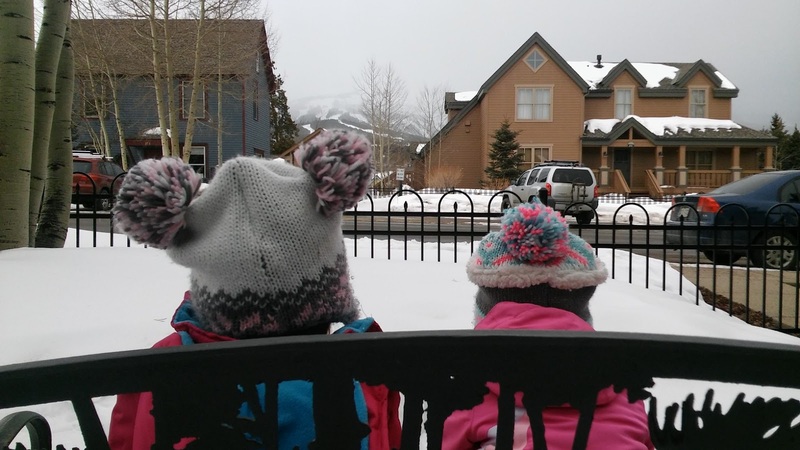 It started snowing, so we went outside for a little to play, but Waverly doesn't like the cold and Ellie was sick, so it was short-lived. About this time Katie got home and we got to spend some time in the hot tub with her brother and his wife. Sitting in a hot tub while it snows all around is really a beautiful thing, and this was one of the highlights of the trip -- a brief respite to prepare for an unknowingly tumultuous ending. We had an amazing home-cooked meal from a local chef who specializes in the task, and then went to bed. Ellie slept the best that last night, though not well. I got up early, eager to leave this forsaken land and get back to some moisture and the shore. 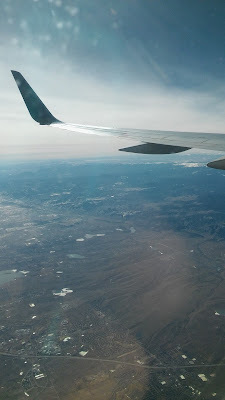 This was my third trip to Colorado, and though the state is romantic in my mind as an outdoor haven (I guess that part is true), the dryness has always deterred me. Chapped lips, dry skin, red eyes -- it all comes with the territory. This hit Ellie hard, as she had cracked and bloody lips and a big red mark on her face from wiping her nose. I guess that's what you get when you spend your entire life less than thirty miles from the coast. But this trip I had even more reason to get home, with all the sickness and such, so I was ready. We scrambled everything together and got to the airport about noon. Again, we fly standby, so you never quite know what is going to happen at the gate. The flights were pretty full, but in an airport like Atlanta, you can count on people missing connections, getting lost or lingering too much during lunch, which means seats will open up seemingly magically. I thought Denver might be the same, but it was not true. We missed a 1PM flight and 3PM flight. Katie had bought a ticket on another airline using some old award miles, so she was guaranteed a way home since she had to work the next day. I actually tried to get a standby ticket on her flight, but it was full as well. I missed a 5PM flight, leaving me little hope of getting out anytime soon. 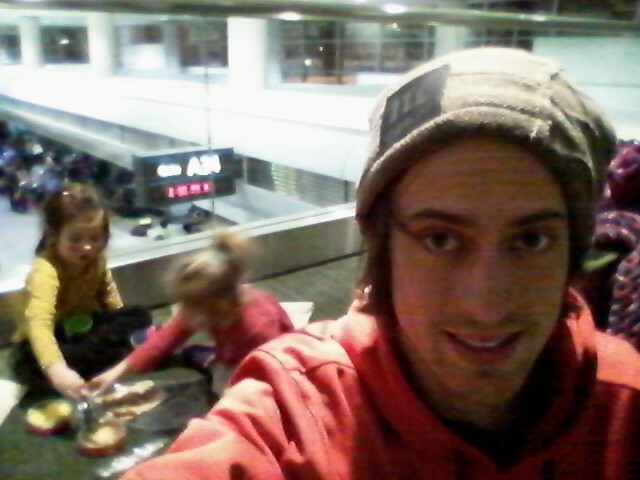 Thankfully, my in-laws were in the same terminal and could help with the girls while I prepared to potentially spend the night in the airport with two young girls. There is a hotel attached to DEN, but my best chance of getting out of there was a midnight flight to New York, with a last-ditch hope of a 1:15AM to Charlotte; which meant getting a hotel room would have been all but futile, the next day flights being quite early. I remember sitting in a chair, looking at my options and talking to my sister-in-law. I told her that I was going to write about this whole thing, because that's how I process life, but I wasn't sure what I was going to say. I always try to find some sort of redemption in these types of situations, but it wasn't coming to me. I was exhausted and so ready to get home. The thought of another five hours in the airport, alone with two toddlers, just for the hope of getting on a flight was daunting. Still, you take it one moment at a time (for we're only promised the grace for today) and press on. They left on their confirmed flights, and I piddled around the now all too familiar airport with the girls, killing time until our midnight flight. This is when I started to lose it. They were exhausted, having missed naps. Ellie was still recovering and Waverly was antsy. At one point I remember yelling and throwing a snack bag against the wall when Waverly did something she wasn't supposed to, surprising the girls (and some nearby airport workers), and then quietly telling the girls that this had been a really rough day and I need both of their help (I said this many times). We made it to the gate where Waverly passed out and Ellie watched Calliou, though I tried my hardest to get her to sleep. Needing sleep myself, I waited, trying to rest without taking my eyes off the girls. At this point I felt like I was was losing my mind, watching it slip away as the snow gently fell through the yellow haze of industrial lights that lit up the runway. Eventually the time came to board and some seats opened up on the flight. Moreover, the gate agents (usually pretty sympathetic to a parent alone with two kids) talked some other guys into upgrading their seats so the girls and I could sit together. I thanked them all, telling them they didn't know how much it meant, and got on -- one step closer to home. This was taken right before I "lost it." The flight to New York was three hours, and you are supposed to sleep because, with the time change, it is technically "overnight." Waverly complied. I tried. Ellie was so wiped out and disoriented that she woke up crying every 10-20 minutes. It was a terrible flight (maybe worse for the people around me), but eventually we landed. I woke up both girls and they were now so disoriented that I had to carry them off the flight. We sat at the gate and they both bawled for about 10-15 minutes. During this time a mom came up and offered some help. I said they just needed to get their bearings, but that they would be fine. Maybe she saw the exhaustion on my face, but she left and returned with a box of granola bars to help. I accepted and she walked away, seeming conflicted that she could not do more. Ellie passed out and I entertained Waverly until she woke. We made our way to our gate and I nervously waited to see if we would get on the plane (this one was more open than the Denver flights). At this point, fatigue hit me like a truck, so I couldn't keep my eyes open. Ellie passed out in her chair, but Waverly, the most rested of us all, was wide awake. She played an iPad game (actually, it's an Amazon Fire, which I like better) and I put my arms around both and nodded off. A short while later the time came to board and we were confirmed! Our ticket home! We got on the plane and I sighed a deep sigh of relief -- the end was in sight. Waverly now was tired and fell asleep next to me while Ellie played the Fire (how did parents fly before those things were invented?). I couldn't hold back anymore, and completely passed out, the all too elusive sleep finally catching up to me. Before I did though, I remember taking off amidst a very foggy day in New York. As we rose, we lifted through and above the clouds, and the sun shone brilliant all around, enveloping us. Peace washed over me as the end of our trip had finally arrived, and we were headed home. It was a good image to mark the end of the trials that we had just gone through -- the sun finally shining on an otherwise dreary day. I'm still not sure where the redemption in all this is, except that we made it through together, and everyone was okay. Perhaps we are tougher now, or more bonded. Or maybe we just know never to move to Colorado. Either way, this was a story I will never forget, and a trial that will stick with me, the memory to possibly return in the midst of some other hard time, reminding me that we can and will make it through. Even with no end in sight, and my mind slowly slipping away, if I take these difficult times moment by moment, God's grace will be enough and we will endure. We always endure.